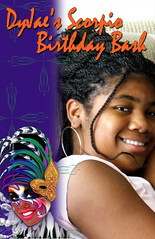 This is an example of a digitally designed poster board for a 13 year old’s birthday party. The image was printed onto an 11″x17″ paper and mounted onto a larger piece of foam core. Guests were encouraged to sign it and leave a message for the birthday girl. Umm…the party was a Mardi Gras theme obviously. That is really cool. I like the colors.